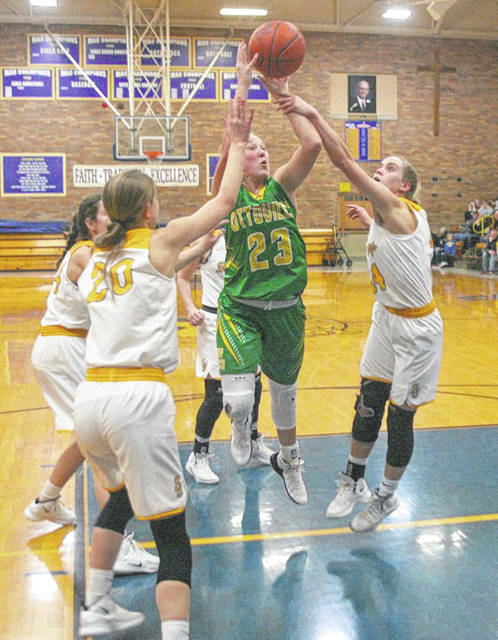 Ottoville’s Kylee Hoersten positions herself inside against Paige Gaynor of Delphos St. John’s during Saturday night’s game in Delphos. Betty Vorst of Delphos St. John’s puts up a shot during Saturday night’s game against Ottoville in Delphos. 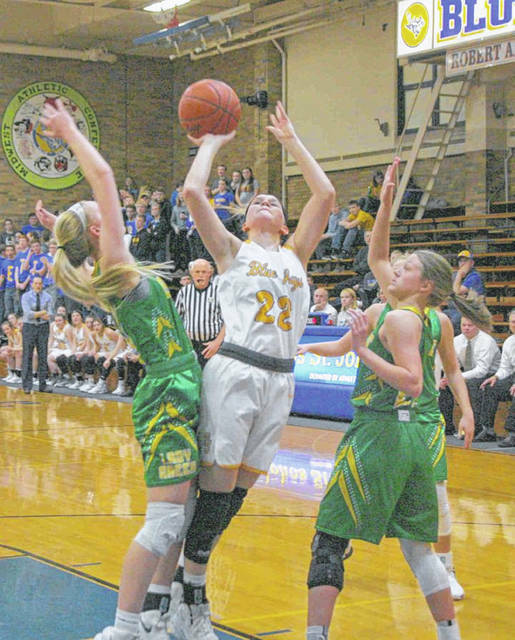 Ottoville’s Kasey Knippen (23) and Peyton Wannemacher defend Aubrie Friemoth of Delphos St. John’s during Saturday night’s game in Delphos. Ottoville’s Kasey Knippen goes up for a shot during Saturday night’s game against St. John’s in Delphos. 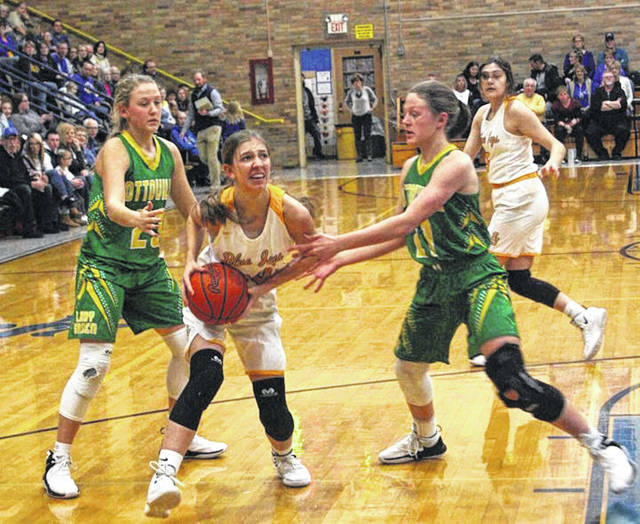 DELPHOS — It was the pace Delphos St. John’s wanted to play. Every time Ottoville pulled out to a small lead, St. John’s responded. That is, until late in the third quarter. Once the game was knotted at 32 apiece midway through the third quarter, St. John’s started to misfire at the offensive end. In the fourth quarter, St. John’s went ice cold, making just 1 of 10 shots from the field. 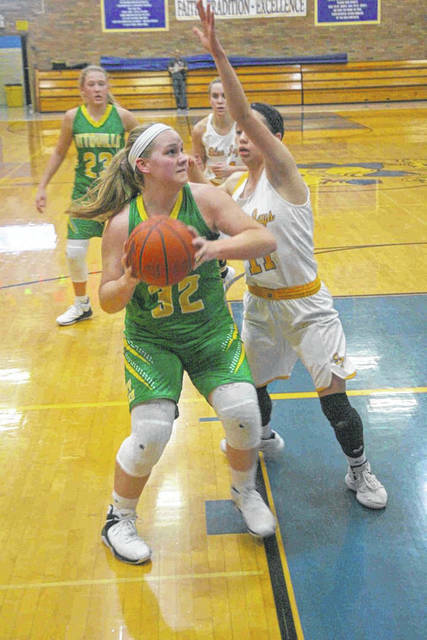 Ottoville capitalized on St. John’s shooting woes and pulled away for a 57-44 girls basketball victory at Robert A. Arnzen Gymnasium in a Saturday night nonconference encounter. With the win, Ottoville improves to 18-3. St. John’s slips to 13-7. Kasey Knippen led Ottoville with 15 points and seven rebounds. Quinley Schlagbaum scored 11 points, including a perfect 4 for 4 shooting at the free throw line in the fourth quarter. Nicole Knippen added eight points and three steals for the Big Green. Hannah Will led St. John’s and all scorers with 16 points, including three 3-pointers. Will also pulled down five rebounds. Paige Gaynier scored 14 points, including three 3-pointers. Last season, Ottoville lost to Minster in the Division IV state championship game, 63-48. The Big Green graduated three starters from that state runner-up squad. On Saturday, the Big Green grabbed the lead and took control, early on. Ottoville slipped out with a 16-11 lead by the end of the first quarter. Kasey Knippen led Ottoville with eight points. Ottoville shot well in the opening stanza, hitting 8 of 14 shots from the field. The Blue Jays connected on 4 of 7 from the floor. St. John’s turned the ball over seven times in the first eight minutes of action. But St. John’s battled back. Early in the second quarter, the Blue Jays knotted the game at 16, on a layup by Melanie Koenig (six points). Two minutes later, St. John’s claimed the lead, 21-20, on a 3-pointer by Gaynier. However, Ottoville responded with a 6-1 run and pushed out to a 26-22 lead by the halftime break. Will and Gaynier led the Blue Jays in the first half with eight points each. St. John’s came out strong in the second half. The Blue Jays knotted the contest at 32 apiece, on a fast-break layup by Koenig, nearly midway through the period. However, Ottoville finished the quarter with a 10-4 run to come away with a 42-36 lead by the third stop. In the final eight minutes of action, St. John’s went ice cold from the field, making just one field goal. Ottoville closed it out at the foul line, hitting 9 of 14 in the fourth quarter. “That was our pace and that’s what we expected to happen in the second half (a close game). But it (shooting) just dried up,” St. John’s coach Nate Stant said. For the game, St. John’s connected on 31 percent of its field goal attempts. Ottoville shot 41 percent from the field. Ottoville turned the ball over 10 times, while St. John’s turned it over 17 times on the night. Ottoville held the edge on the boards, 36-25. Betty Vorst, who came into Saturday’s contest averaging 13.4 points per game for St. John’s, was held to just six points. The 1978-79 Delphos St. John’s girls’ basketball team that won the AA state title with a perfect 26-0 record, was honored before the start of Saturday’s varsity game.